Barton Albion was another literary club active in the early 19th century. They enjoyed some minor success in the Sussex leagues, but their story really began following forced eviction from their Norland Park stadium. Unexpected sponsorship from the Barton Estate allowed them to relocate to Devon. Unfortunately, this support was not enough for a decent-sized stadium, leading officials to doubt whether The Cottagers (as they were nicknamed by fans) would ever make an attractive prospect for larger investors. Despite their financial problems and the failure of various promising transfers*, the team managed to revive their fortunes by balancing creativity with discipline and dependability. The result was promotion to a higher league and a move to the much larger Delaford ground. The playing squad was famous for its flawed characters. There were high expectations of striker Edward Ferrars, for example, but he was unwilling to take up more advanced positions on the pitch and lacked the ambition of some of his teammates. Instead, he tended to hang around on the periphery of the game until the final minutes, when he would move across to combine well with Elinor Dashwood. 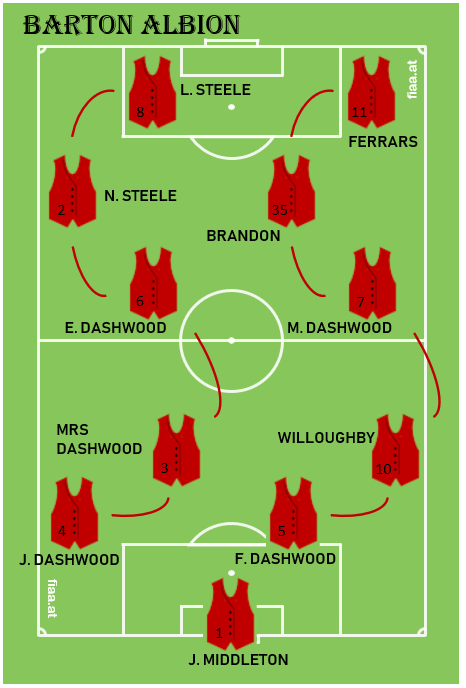 Miss Dashwood was perhaps the team’s best player, and an early exponent of the midfield holding role that demands discipline, organisation and awareness of the wider game. Alongside her, Marianne Dashwood (MD7) was a mercurial talent much influenced by the Cowper and Scott footballing philosophies. Prone to injuries in wet conditions, she suffered a terrible loss of form when a transfer to Coombe Manor fell through, but recovered to form a useful on-field partnership with Colonel Brandon. The latter was a dour player but a crucial member of the dressing room, not to mention an important mentor for younger players. Lucy Steele did not share fellow-striker Ferrars’ reluctance to put himself forward, taking every opportunity to advance her position. Unfortunately, her movements often came to nought thanks to her sister’s propensity to reveal the team’s tactics to the opposition. In defence, the formidable John and Fanny Dashwood gave little away and were also known for their tough salary negotiations. Though well established in the pantheon of literary greats, Barton never quite caught the imagination of the public in the same way as, for example, the Kellynch Hall or Pemberley teams. Football scholars attribute this to the absence of a star forward in the same mould as a Wentworth or Darcy. *Some claim this was due to the agitations of a local journalist, Mrs Jennings, the source of numerous false transfer rumours.